From starting off as a centre to provide educational support, to running a full-fledged English medium school - Vidyarambam has come a long way. The dream of supporting rural children in their education became a concrete reality with the help of Rotary Club International and the Tamil Nadu Government, in the district of Nagapattinam. December 26, 2004 is a day that the people of Nagapattinam will never forget. A devastating tsunami struck coastal Tamil Nadu, and Nagapattinam bore the brunt. More than 7,000 people died, and the destruction left in its wake was immense. Tens of thousands were left homeless, and many families were severely traumatized. Worst of all were the hundreds of children, left orphaned for no fault of theirs. The world responded to the tragedy, sending in men, material and aid, and one among them was the Rotary Club of Madras Central. The collector of the Nagapattinam District outlined a vision, which was a challenge and an opportunity to help those in dire need. The Rotary accepted the challenge and a housing complex was built. It could house 200-orphaned children, a primary school for the Tsunami affected children and a senior citizens' home. 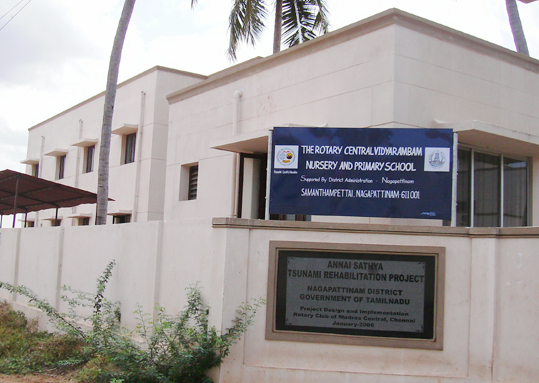 The Tamil Nadu Government provided the land and the Rotary took up and completed the job of building the complex. Though the school building was ready by July 2006, the Rotary did not succeed in identifying a suitable NGO to establish and run the school until they contacted Vidyarambam. In an agreement signed between the Rotary and Vidyarambam, the Rotary agreed to hand over the building with its fully furnished classrooms and Vidyarambam agreed to fund and run the school. The primary aim was that the orphaned children would be admitted into the school and educated free of cost, to the extent of space and capacity available. Vidyarambam could enroll children from outside charging a very nominal fee. This agreement encouraged the district administration of Nagapattinam to join the efforts and support the project in the interest of under privileged children. A tripartite agreement was soon signed. Vidyarambam swung into action and swiftly established the school, naming it "THE ROTARY CENTRAL VIDYARAMBAM NURSERY AND PRIMARY SCHOOL". On June 4, 2008, the honourable Tamil Nadu Govt. Minister for Dairy Development, Mr. U. Mathivanan, inaugurated the school in the presence of many officials of the district administration and several Rotarians from Chennai and Nagapattinam. The parents of the children admitted in the school witnessed the function with great hopes that their wards would soon be among the best-educated youths of the nation. During the function, the Minister gave bags and books to the children. Vidyarambam chose to run LKG, UKG, STD 1 and STD 2 to start with and carry it up step-by-step, providing quality education all along. The opening strength was about 108, and when the 5th STD was introduced, they had the full capacity of 250 students. Ninety-five percent of the children are from fishermen's families and most of them are first generation learners. A special curriculum was developed to teach languages, arithmetic, environmental science, life skills, Yoga, basics of computers, art and culture and indoor and outdoor games. The library has not only books, but also hundreds of toys and educational games. The successful methodology that Vidyarambam used for educational support in its rural education was replicated in this school too. Recognizing the ability of its own teaching staff, the school was fully manned by Vidyarambam's experienced tutors, drawn from different parts of the State. The aim of Vidyarambam was to coach the children to take up the Matriculation exams in the English medium.